Nestled in the lower southern region of Satpura Hills, Pench National Park is the beautiful and verdant region displaying nature's beauty at its best. It is named after the Pench River., which flows through north to south of the park. Pench National Park is spread in an immense area of 758 sq kms and is positioned on the boundary of Chhindwara and Seoni districts in Madhya Pradesh. The forest belt of the park also extends to Balaghat in the east and Nagpur in south. The scenic beauty of the park has intrigued several naturalists like Rudyard Kipling and Captain J. Forsyth. The diverse topography of the park makes it a perfect abode for oodles of exotic flora and fauna species. 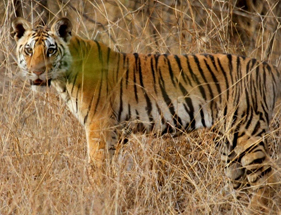 Tiger and leopard are the major attractions for wildlife enthusiasts here. Other major wildlife species that can be found here are Sloth Bear, Four Horned Antelope, Spotted Deer, Barking Deer, Sambar, Wild Pig, Nilgai, Porcupine, Indian Python, and Indian Pangolin. In the waters of the park, the major fish species found are Padhan, Mahasir, Chalar, Jhunda, Dadai, Mahur, Kunda, Sanbal, Mrigal, Rohu and Calbasu. Moreover, there are scores of beautiful avifauna species found here in the park. The main avifauna species in the park are Little Grebes, Whitened Storks, Herons, Darters, Egrets, Bulbuls, Tailor Birds, Mynahs, Orioles, Barbets, Sunbirds, Minivets, Wagtails and Parakeets. The flora in the park is majorly dry mixed deciduous and southern tropical dry deciduous. The major flora species are Teak, Saja, Bija, Lendia, Dhaora, Haldu, Amaltas. The dense woods of the park create mystifying landscape for nature enthusiasts to capture in camera. By Train: Seoni (35.6 Kms) and Nagpur Railway Station (166.1 Kms) are nearest railheads to the park. Nagpur Railway Station is more prominent as it is connected to various major cities of the country. By Road: A tourist can take the bus from either Khawasa or Nagpur. If the traveler is coming from Madhya Pradesh, the park can be reached through NH7. The park is just 12 kilometers from Khawasa-Karmajiri Road. If the traveler is coming from Maharashtra, the park can be reached via Pauni on NH7. Fishing is strictly prohibited in the park. You can also visit Kumbhababa, Kandadev and Bagdev Temples. These temples are located within the reserve. There are in total 3 entry gates to the park- Jamtara Gate, Karmajhuri Gate and Turia Gate. Turia Gates is the most convenient entry gate to the park. To spot tigers and rare animal species, one must prefer morning safari. Always follow the given guidelines.